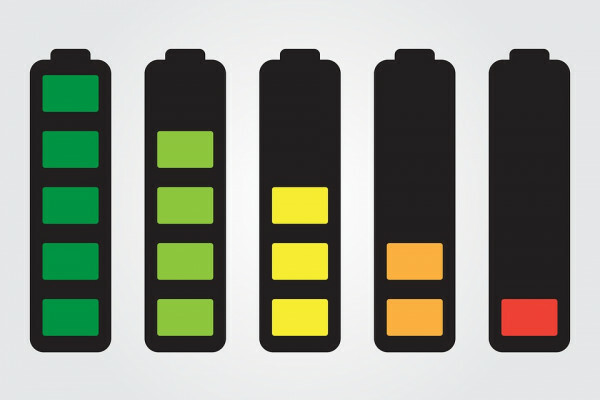 Lee - So, a battery just converts chemical energy into electrical energy. That's the kind of textbook answer but it's a lot more interesting than that. Let's go back to the very old batteries, the lead-acid batteries, or even to a lemon potato battery. Chris - With a bit of copper and a bit of zinc? Lee - Exactly. So you got these metals and what happens is these metals lose electrons when they react with the acidic contents of the lemon, and that reaction pushes out electrons that go round a circuit. Those electrons aren't lost, they go around the other side to complete the charge, and that push you get is what starts the way the batteries work. So that was determined and then we went into lead acid where the energy if you like comes from solid lead, and as that lead is dissolved in the acid as you take out as you power your lamp or whatever, the lead is dissolved. When its exhausted, there's no more lead left but all is not lost, what you can do is reverse that process and put some electricity back in. You literally push electrons back onto the lead ions, as we call them, and they form back the metal and go back to the electrode. That's a really old-fashioned battery that is really reliable; in fact literally billions of lead acid batteries are still used today. Chris - But why Lee, can I, not to recharge some batteries? If I buy an off-the-shelf battery in a supermarket that's not dubbed rechargeable I can't reverse that reaction? Lee - You can. I used to as a kid because you can get them to explode. And the problem is that would have to recharge them so slowly it would just take too long. What I did, I just forced as much power in and, of course, they expanded and they ruptured and all the acid came out and that was rather bad, but I thought quite good fun. But if you take now a lithium battery, which also is kind of scary because lithium batteries can catch fire. On aeroplanes everyone is terrified about lithium batteries. Well lithium metal’s really really reactive but has a high energy density and that's why they're so good for our mobile phones, and so literally, the lithium metal being dissolved packs a lot of power. So we're spending a long time dissolving that lithium in a kind of plastic bag, in a kind of membrane to try and make sure that lithium goes back again without forming crystals that then cause the bag to expand. Your listeners might have had mobile phones or computers that suddenly warp out of shape, that's because the lithium battery has failed. I wouldn't advocate doing anything with that other than disposing of it correctly because it could catch fire. And the other thing is if you put a nail or something into a lithium battery will catch fire. Basically, there are lots of different developments in these batteries and the quest is to have much higher energy density batteries, a bit like one that would give you something like, I guess, the density of diesel. Previous What makes an anxiety disorder? Next How long did the dinosaur extinction last?